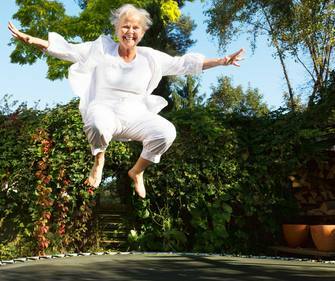 Many of our senior citizens have never considered using a trampoline for exercising, and many of us think associate trampolines exclusively with young children. However, trampoline-based rebounder exercises for seniors are a wonderful way to maintain optimum health and maximise quality of life. 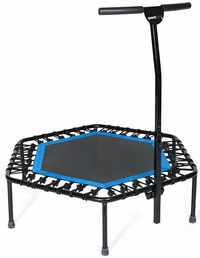 However, many people are unfamiliar with trampolining as a form of exercise. With this in mind, we've compiled a handy guide with everything you need to know when it comes to adding rebounder exercises into your daily routine. So, what are the benefits of rebounding for seniors? Is Rebounding Really Good for You? Increased cardiovascular health. A rebounder-based workout offers all the health benefits of more traditional exercise regimes, including improved circulation, lower blood pressure, and strengthening of the heart muscles. Low impact. Unlike more strenuous forms of exercise, rebounder exercises put less strain on the muscles and joints, making them an ideal choice for seniors. ​Improved bone density. The gentle impact of rebounder exercise can help strengthen bones, which helps to prevent conditions such as osteoporosis and bone fractures. Fun! 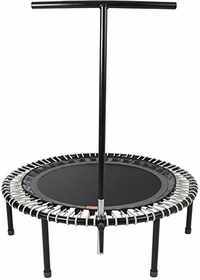 As anyone who has ever bounced on a trampoline will tell you, rebounder exercise is a highly enjoyable way to work out. When you enjoy your chosen form of exercise, you're far more likely to stick to it. If you're considering taking up rebounder exercises, you may be wondering where to start. Luckily, there are a wealth of resources for seniors who wish to take up this beneficial activity. Firstly, find out if there are any classes that focus on mini trampoline exercises for seniors in your neighbourhood. Nowadays, many health clubs and fitness professionals are catching on to the fantastic benefits that rebounder exercise has to offer. As a result, many now offer group rebounder sessions designed to meet the specific exercise needs of seniors. 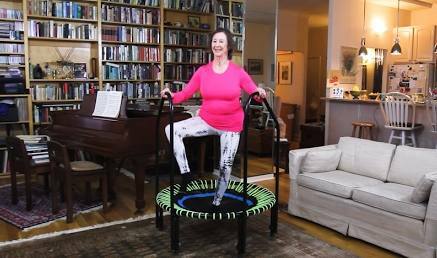 If you prefer to work out in the comfort of your own home, you can access a wealth of guidance videos on social media platforms such as YouTube showing you how to exercise using a rebounder. They offer expert advice and step-by-step instructions without having to shell out on expensive gym membership. Finally, nowadays you can purchase specialist exercise DVDs that can help you implement your new rebounder exercise plan. Many of these are very high-quality and include workouts planned by experts in exercise plans for seniors. These allow you to access the specialist instruction and advice of a fitness professional, all from your own front room. If you're considering including rebounder training in your exercise plan, you may be wondering which rebounder is most suitable for seniors. 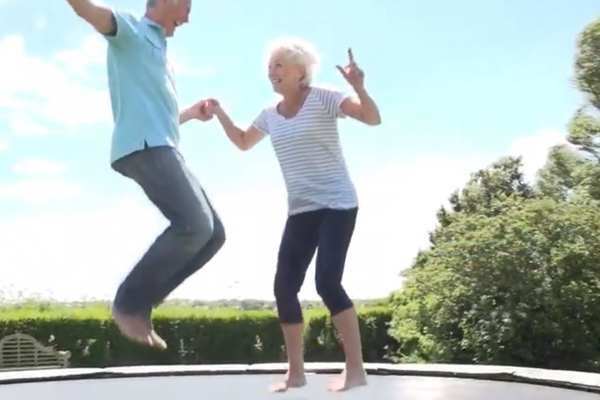 After all, if you're considering purchasing your own mini trampoline, you'll want to be confident that the product you are buying is both high-quality and safe for use by senior citizens. A rebounder designed for general use may not be the best option for your personal needs. If you're new to rebounder training, you may be concerned about the possibility of feeling unstable or even falling from your mini trampoline. Perhaps you are beginning to feel unsteady when carrying out your day-to-day activities, and are worrying that rebounder training may be unsafe. Thankfully, many modern rebounders include a stability bar as standard. These sturdy bars are attaches to the frame of the trampoline, so you can hold onto them while you exercise. This allows you to exercise with confidence, knowing that you can protect yourself from overbalancing or falling. They also allow you to perform movements in a more controlled way, protecting your joints and muscles as you exercise. Furthermore, some brands of rebounder have stability bars that are height adjustable and removable. These are a great option, as you can ensure they are set at the perfect height to suit you. If you grow in confidence over time, you can eventually remove the bar if you no longer need it. Hopefully after reading our helpful guide, you will have discovered that rebounder exercises for seniors can be an excellent addition to your personal wellness program. Whether you are hoping to improve muscle tone, bone density, or simply overall fitness, we hope you will explore its possibilities when it comes to improving your physical wellbeing. Not only that, but bouncing on a trampoline can be a tremendous stress-reliever and source of fun and enjoyment. There are many benefits of rebounding for seniors, so perhaps it's time to experience them for yourself!